Written by Aingeal Rose for this time period, this is a book like no other. No one can deny that we live in exciting times. Changes are occurring almost daily on every level of our lives. Never in our lifetime have we been witness to a global awakening of this magnitude. The people are ready. Children are being born with exceptional gifts demonstrating that the human race is changing into a more spiritually evolved species. Neck in neck with that, those involved with the old system of war, greed, corruption, competition and control are trying to enslave us even further. We have been under that thumb for far too long! ... we must ALL be willing to change – to be more self-sovereign – to cooperate and share, to CARE. This is a necessity for us to flourish, not just survive. Where is God Source in all this? Is there a God Source? Does IT orchestrate these changes? Is this Armageddon or Paradise? Are cataclysmic Earth changes a necessary part of these times? "Akasha" which is a Sanskrit word meaning "ether" and implies a spiritual plane where the entire history of Life is recorded. "Akasha" has been described as an ancient Library where each one of us has our own "Book" of our many lifetimes and sojourns in Spirit. 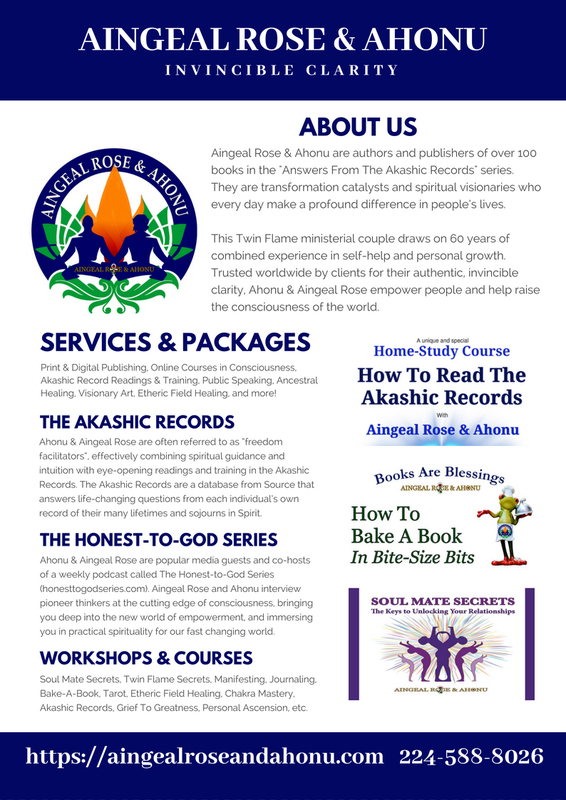 This "library" has been given the name "the Akashic Records". What Intelligence is it that would bother to record all the events of Life? What would be the purpose? That it matters a great deal is obvious when we see that it is part of the life and death-transition process. Each and every person is presented a "life review", a summary of his or her life, those they’ve affected and were affected by. Could things have been done in a better way? Those returning from NDEs report that not only do they "see" all the events of their life; they also feel the impact of their choices upon others for good and ill.
Our progress is observed and measured not by a punishing God, but by ourselves. 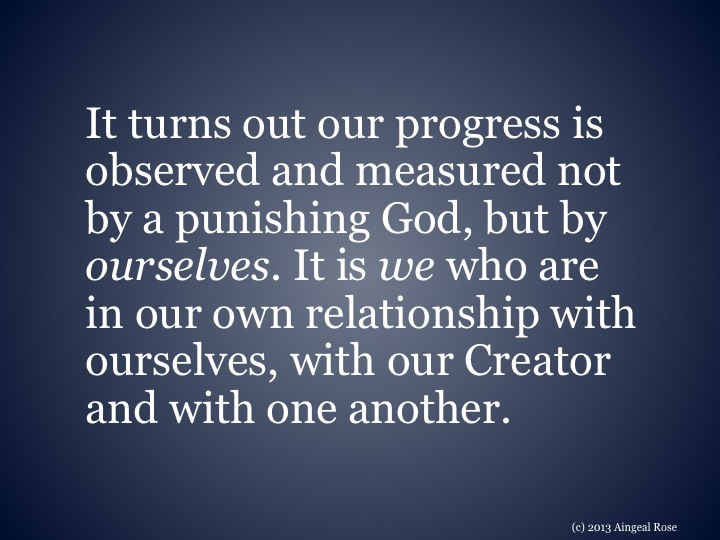 It is we who are in our own relationship with ourselves, with our Creator and with one another. This is the first time I’ve ever written a book review and felt i had to share with others this gem of a book. Like so many others in these so called "challenging times" I question what God, Source, Supreme, the Universe has in store not only as an individual but for all of humanity. 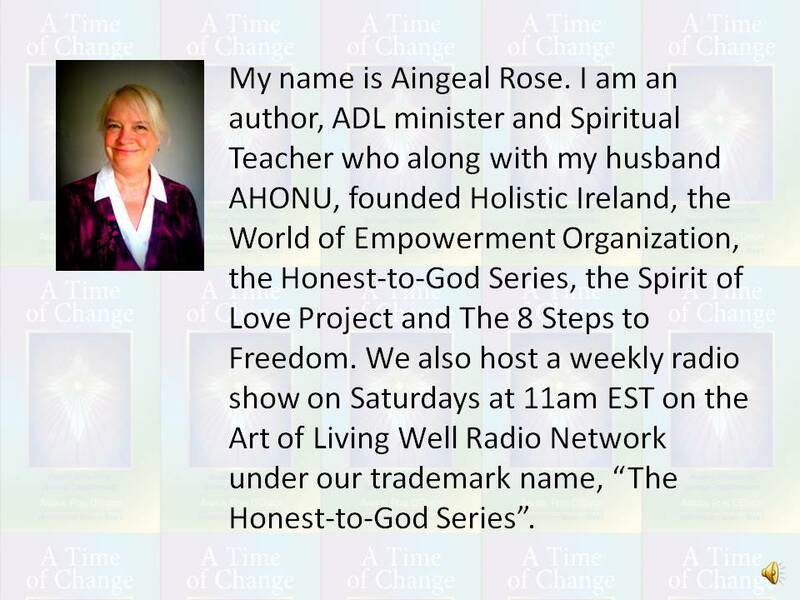 I’d heard of Aingeal Rose’s work and her books. What I like about this book is her straight forward approach and the no-nonsense way she has written it, in question and answer format, taken directly from the Akashic Group sessions. 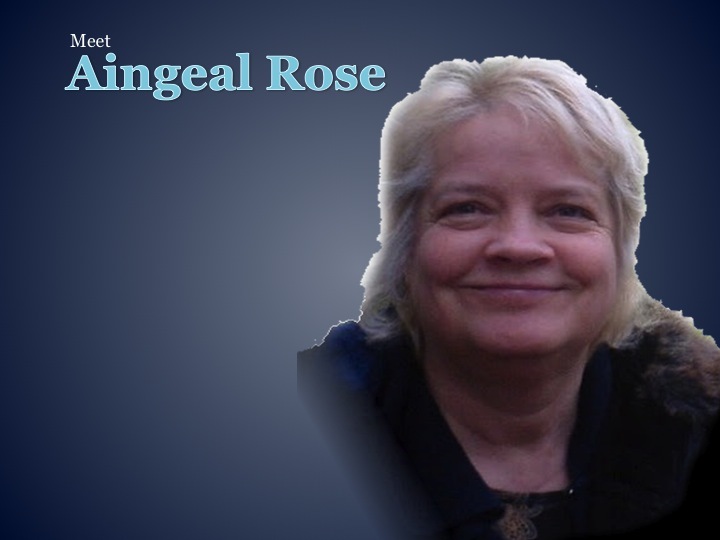 Aingeal Rose offers support, guidance and sometimes comforting, informative answers which I found easy to understand. I have the book on my coffee table and keep dipping into it so that more is revealed to me. A good buy for anyone on the ascension path or searching for answers to long held questions and I thank Aingeal Rose for sharing this information with the world. I was impressed with "A Time of Change". I found the information original yet consistent with other well-regarded sources. The answers were not superficial or standard feel-good fare. They provided illuminating perspectives on a wide range of questions we all have probably asked ourselves, like "What is heaven?" "What happens to the spirit of a suicide?" "Can anyone develop telepathy or read the Akashic Records?" "How can we increase prosperity for ourselves and the earth?" Because the book is a transcription of Q&A from Aingeal’s live channelings, there’s not a flow or systematic narrative thread to follow, although she did group similar answers into chapters like Health, Indigo, Crystal and Rainbow Children, Prosperity, Technology, Our Future Selves, and more. I found a lot of wisdom, common sense and food for thought here, and it makes for very intriguing reading. This book is packed with dozens of really deep questions about how things REALLY work. It equips readers with valuable insights that you will not get anywhere else. This is by far the best body, mind and spirit book ever written in modern times. The book is well-written and straight-forward. It is written in a Q&A format, which means you can skip around to sections that are most compelling to you. Once you pick this book up, it truly is difficult to put it down. So much wisdom and amazing insights are packed inside. This book will undoubtedly change the way you see the world and give you the tools and empowerment you need to live a life you truly love!!! FIVE STARS and a real bargain price too! You will absolutely be glad you picked this book up. You may want to purchase copies for the people you most care about too. This is powerful stuff. It is easy to read, and it just may change your life for the better. 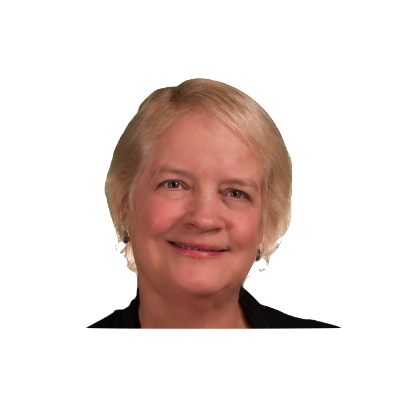 Through accessing the Akashic Field, I have been privileged to provide understanding, guidance and comfort to my clients from levels that go far beyond our linear view of life. Everything does make sense – this is the gift of the Akashic Records. People who have had Near Death Experiences (NDE) report seeing their entire lives flash in front of them on point of death. This is evidence of the Akashic Records, the recording of even the minutest detail of a person’s life. Not only are the events of Life recorded, but the impact of those events on ourselves and others is also recorded. The implications of this are a bit mind boggling if you think on it! ‘Future’ only implies that which is not yet Self-realized. There will come a time, however, when you will be done with perception and want to be your true Future Self, now. You don’t have to earn your way to God. 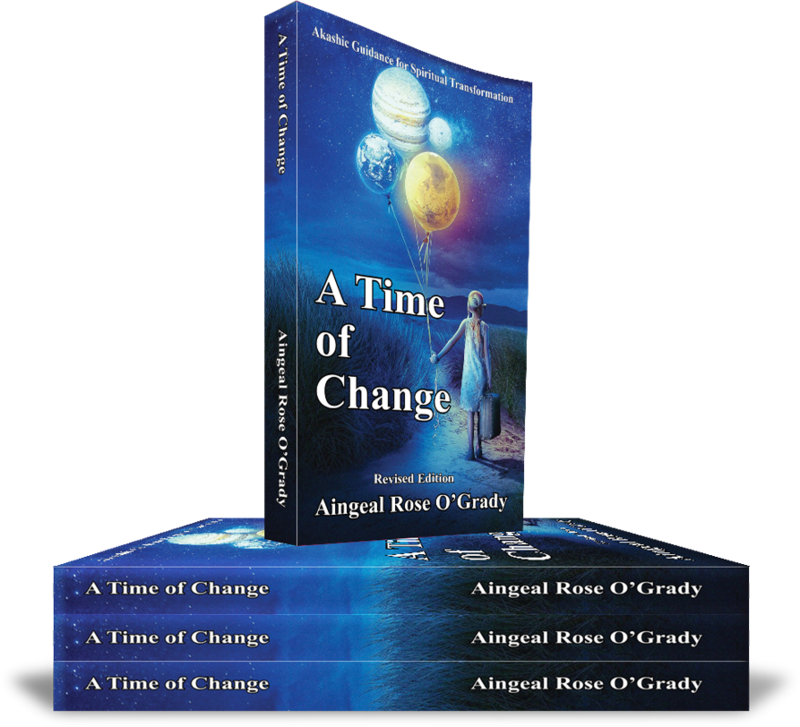 A Time of Change by Aingeal Rose is available on all devices in all formats. It is on Kindle, .mobi, pdf, etc., so you can bring it everywhere! 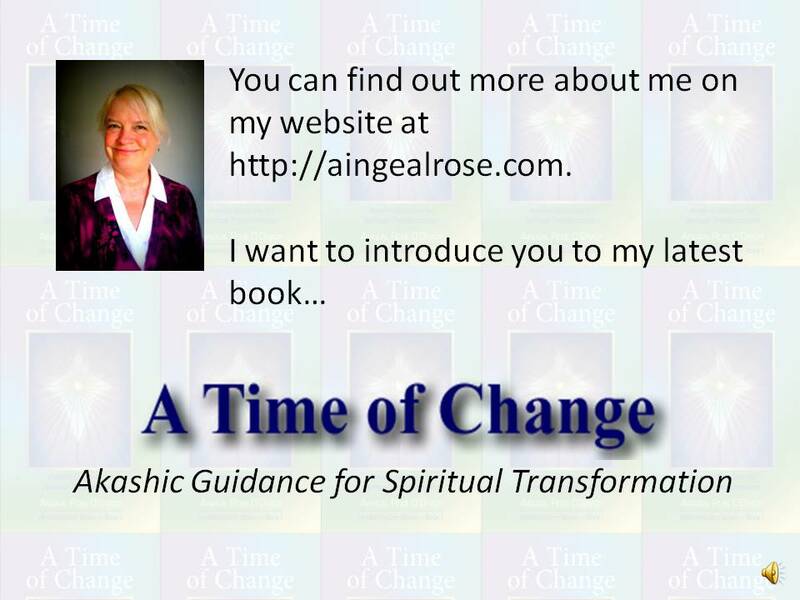 All the ways you can get "A Time of Change" ensure you will benefit from its wisdom, whether you are listening to it as an audiobook as you drive or jog, or in bed with a print or Kindle version. 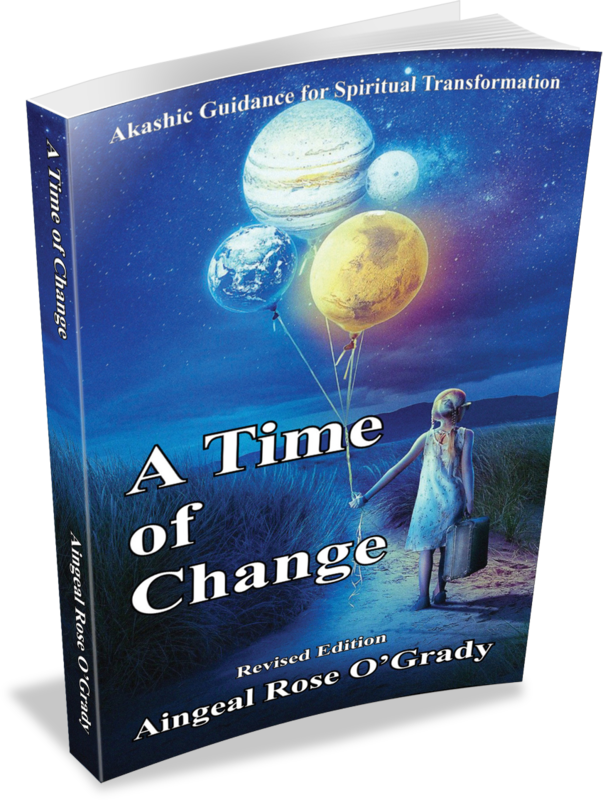 "A Time of Change" is one of the most inspiring books you will read. It will confirm your beliefs and open your eyes to what you need to learn. The book is beautifully written in a way that flows with grace. You will definitely reread it for continued inspiration. © 2018 Aingeal Rose & Ahonu. All rights reserved.